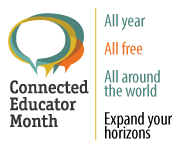 Join NCTE for Connected Educator Month! When October hits, you’ll be well into the routines of school and perhaps ready for some fresh inspiration. That’s why for the past several years educators from around the world have celebrated Connected Educators Month -- and you can too! Connected Educator Month (CEM) is a month-long exploration of key educational issues through online communities and networks, dedicated to broadening and deepening educator participation, as well as bringing online community and education leaders together to move towards a more fully connected and collaborative profession. Last year's CEM featured more than 300 major education organizations, companies, or communities officially participating, including, for the first time, entire states and districts; more than 600 national events and activities conducted officially; more than 1 million web pages and other online locations referencing, promoting, or discussing the event; and more than 14 million educators and others reached around the world via Twitter alone. NCTE and NCLE are hosting the theme “Innovations in Assessment” this year, and we’ll showcase a variety of events and opportunities to engage with leading thinkers on the topic. Visit the calendar of events and use the search box and filters to find events & activities of interest--or maybe add one of your own! View our Innovations in Assessment Kickoff! This document was printed from http://www.ncte.org/connected-educator.